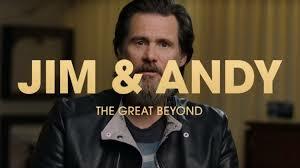 Brief Synopsis – Documentary interview with Jim Carrey about his experiences filming the movie Man on the Moon in 1999 and how he channeled Andy Kaufman during that time period. My Take on it – I have always loved the film Man on the Moon (1999) which is based on the life and career of Andy Kaufman. This film is basically a 90 minutes interview with Jim Carrey discussing that pivotal role for himself along with lots of behind the scenes footage of the antics that Carrey caused during the filming. Carrey is able to give us some great insight into his own psyche and how he tried to personify Kaufman’s persona during the filming. The problem here is that we are basically watching a conversation with Carrey about the experiences and instead of giving us other perspectives from other cast members as to what really transpired, we on;ly get one viewpoint which gets a bit monotonous. The behind the scenes footage that they released for this film is extremely fascinating to watch and the fact that Carrey is able to give us some intriguing anecdotes about what really transpired and most of them are quite befitting for a film about the life of Kaufman. Bottom Line – Great look at some of the behind the scene antics during the making of Man on the Moon (1999). Carrey gives us some nice insight into his own psyche but parts of this film are just watching Carrey talk to the camera. It would have been more fascinating to get the perspectives of other cats members on how this all played out back then. The footage obtained for this film is fascinating to watch tho because it is so befitting of such a film. Recommended!